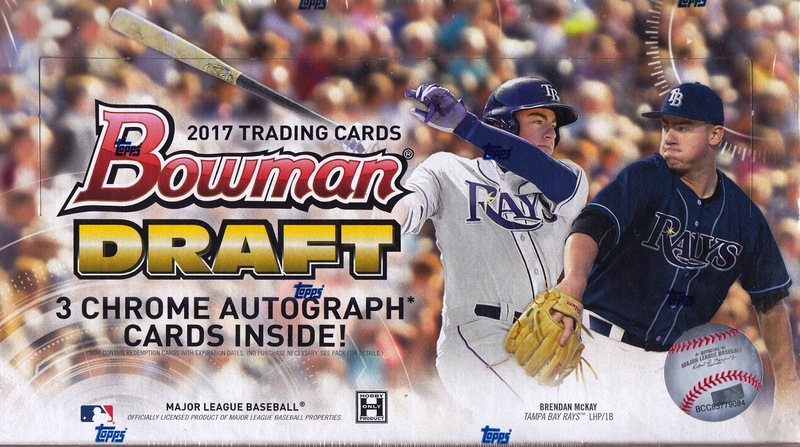 Baseball card collectors in search of something shiny and new for the holidays have to look no farther than 2017 Bowman Draft Baseball. This set provides fans and collectors a grand opportunity to familiarize themselves with the first official baseball cards of next season’s top prospects. Each box guarantees three autographs and plenty of chrome cards, both in the form of coveted refractors and serially numbered color variations. Two first-round picks, Minnesota Twins shortstop Royce Lewis (1st overall pick), and Tampa Bay’s two-way player, Brendan McKay, headline the set. While Sports Illustrated cover boy Hunter Greene is noticeably absent, that does not detract from the attention 2017 Bowman Draft Baseball deserves. The box provided for this review served up a complete base set, which will please collectors looking to get into the depths of each organization’s newest additions to their minor league systems. Putting the base set aside, the chrome cards and color parallels bring the prospects to the forefront and make for attractive additions to any collection. Bowman has expanded their Chrome Draft autographs to over 75 prospects, which allows collectors a wide assortment of players that they can land in each box. With over a dozen parallel variations of each autographed card, player collectors will be kept busy the entire offseason trying to chase down entire runs of their favorite player’s signature. Bowman keeps it simple with the chase cards, limiting the hobby boxes to the Defining Moments, MLB Draft History, and Recommended Viewing insert sets. Both the Defining Moments and MLB Draft History sets also have autographed variations, adding to the excitement and potential of scoring a Hall of Fame signature or one from Bowman’s selected group of exclusive young superstars. While the box opened for this review did not yield any of the aforementioned insert autographs, it did provide a rare short print in the form of a Kevin Maitan facsimile signature image variation. 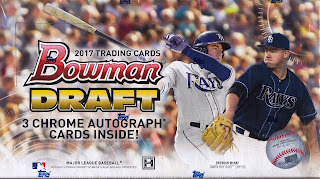 Debuting right in time for the holiday season, 2017 Bowman Draft Baseball makes for a wonderful gift under the Christmas tree that will provide collectors the chance to lose themselves in the 2017 MLB Draft class while they wait for spring training to emerge.